Lead has been gradually removed from our lives during the 1970s/1980s, when scientific research conducted during the 1960s saw that it was taken out of gasoline, paints and other household products, and further legislative measures gradually saw it eradicated from most other high risk areas. The Restriction of Hazardous Substances Directive 2002/95/EC (RoHS) legislated to see metallic lead removed from electronic components, as well as other hazardous constituents such as mercury or cadmium, and replace them with alternative materials that would reduce the overall ecological impact. The legislation was brought into effect in 2006, but by then the majority of suppliers had taken the initiative and conformed to it. There are a couple of notable exemptions to the RoHS directive – where, at the time of its implementation, no viable substitute could be found. One of the areas where an exemption was allowed to be applied was in thick-film resistors, and even today lead oxide compounds are permitted to be used in their glass elements. Lead oxide compounds are much more stable and thus pose less of an immediate threat, a potential risk still arises when these devices are left in landfill and the toxic heavy metal compounds are allowed to leach into the groundwater. Thick-film resistors are found in many smart devices, and as more are being sent to landfill every year, there is renewed pressure to look at narrowing the scope of the existing exemptions and make regulatory guidelines more stringent. It is important for OEMs to be aware that the current RoHS exemptions in place are subject to periodical review. This may result in a component that was previously cleared for use and specified into electronics designs no longer being within the exemption area. This would obviously have serious and extremely costly implications for an OEM that fails to be adequately prepared, and this is driving interest in preemptive action against such a scenario. The next review of the relevant RoHS exemption – 7(c)-I ‘Electrical & Electronic Components Containing Lead in a Glass or Ceramic Material’ – is scheduled for 2021, and it is expected that during this review, the inclusion of lead oxides in thick-film resistors will be subject to considerable scrutiny. OEMs must be able to access compliant components that can make their devices future-proof in case RoHS exemption changes are made. Consequently, they will not have to worry about allocating valuable time and engineering resources to make amendments further down the line – when there is an imminent deadline. Developing glass for thick-film materials that doesn't contain lead oxides is not that simple, and up to now those materials that have been developed have had associated performance penalties. 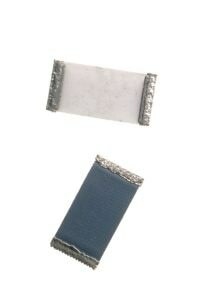 Commodity resistors with lead-free glass are already available and may be used in certain less-demanding cases. However, they still are not close to attaining the benchmarks necessary to address higher-end applications. This is set to change with the introduction of a new generation of completely green thick-film resistors. Drawing on the work that has been done by TT Electronics and its supply partners during a period of 18 months, these green thick-film resistors ensure long-term RoHS compliance remove the reliance on exemptions. Furthermore, the inconvenience of OEMs having to undertake subsequent system redesign work is mitigated. The Green High-Voltage Chip (GHVC) resistors cover resistance values from 25 kΩ to 100 MΩ, are supplied in standard EIA 1206, 2010 and 2512 package formats, and have respective power ratings of 0.3 W, 0.5 W and 1.0 W. They support a working temperature range of -55 °C to 125 °C, with each of these robust components offering up to 3000 V Limiting Element Voltage (LEV) and being resilient enough to withstand up to 7 kV peak voltage for a 1.2/50 µs surge. The ±100 ppm/°C temperature coefficient and -1.5 ppm/V voltage coefficient ensures the precision of their operational parameters is always upheld. As well as this, these resistors feature anti-sulfur terminations that have passed ASTM-B-809 tests – making them suitable for the harsh sulfurous environments that may result from use in mining and chemical processing tasks. The diverse range of compact resistors has been optimized for deployment in modern, densely packed electronic circuitry – allowing the device to sustain elevated voltage levels without the need to utilize multiple components. This saves board real estate and keeps the overall cost of materials in check. They are aimed for use in either high-voltage sensing or circuit protection functions in high-end devices such as hybrid electric vehicles (HEVs), industrial automation, clinical medical and home healthcare applications. 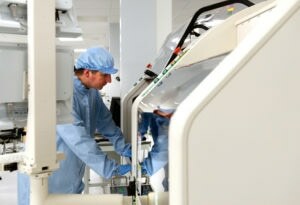 Though crucial in all forms of electronic design, the future-proofing aspect will be of particular value in a medical context, as using GHVC components will avoid costly redesigns as well as long drawn-out requalification procedures. By using cutting-edge materials and implementing a new fabrication process, but without the significant financial burden of upgrading equipment, the migration to a completely lead-free strategy has avoided a major increase in production expenses. This has allowed the price points to remain effectively the same as with products containing lead oxides. The initial expectation is for GHVC pricing to average around 20% higher – though this will decrease post-launch as volume demands increase and economies of scale start to kick in. Operating in an already unpredictable business landscape, OEMs need to do everything in their power to safeguard the investment made in their system designs and keep the financial dangers of having to make alterations or carry out time-consuming re-spins at a minimum. The sourcing of components that pre-empt further restrictions to RoHS, and any redefining of the area that is exempt, can play a key part in achieving this goal. Though the RoHS exemption for lead oxide in glass has remained constant for several years, it would be unwise for OEMs to believe that it is completely immutable — with a possible chance of greater restrictions. Technological advances in the materials employed in passive components have now reached a stage where the possibility of totally lead-free supply is real, without performance compromises needing to be made, or unit cost increases being witnessed. This information has been sourced, reviewed and adapted from materials provided by TT Electronics. For more information on this source, please visit TT Electronics.